A short, engaging, evangelistic book, perfect for giving away to non-Christian friends, family and church guests. Christmas is a great time to give a non-Christian friend or church visitor a short book getting to the heart of what it's truly all about. This is perfect for giving out at church events, or with a present. 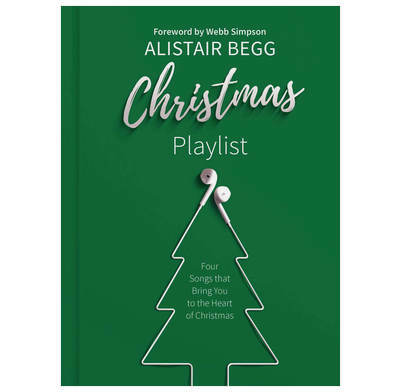 Music is everywhere at Christmas—chart-toppers, carols, children's tunes… Alistair Begg takes us to four songs that were sung by people at the very first Christmas (and his favorite carol). In this short, winsome book a teenage girl, a respected priest, a group of angels and an old man bring readers to the heart of Christmas, showing them the joy and peace that comes from meeting a baby who lay in the food trough and changed eternity. We are delighted to offer you an early Christmas present as you purchase this product: a free Keith and Kristyn Getty song, together with sheet music! Simply visit Free Song and type the code gettyfree. 1. The Teenager's Song: Who is God? 2. The Priest's Song: What's the Problem? 5.3" x 7.3" x 0.3"
Christmas is a great time to share the gospel with the people you love, and Alistair’s book is a great way to help you do it. I believe that many rock lyricists think they are screaming at God, when they are really screaming out for Him. Alistair Begg connects Biblical song writing to modern song writing to make his illustrations come alive. A wonderful treat! Like sipping coffee, with familiar--and some new--Christmas music playing in the background, while a best friend explains what it actually means. So sit down for a while with Alistair Begg. By the time you get up you will understand why, from the very beginning, people have written songs about Christmas and wanted to sing them. And you may have received the best Christmas present ever! Right to the heart of the Christmas Story and easily read and understood.